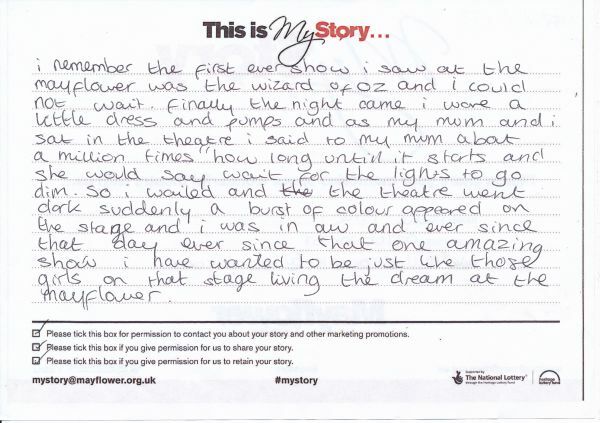 My Story Card: Millie Price recalls coming to the theatre for the first time to see The Wizard of Oz. I remember the first ever show I saw at the Mayflower was the wizard of Oz and I could not wait. Finally the night came I wore a little dress and pumps and as my mum and I sat in the theatre I said to my Mum about a million times "how long until it starts ["] and she would say wait for the lighjts to go dim. So I waited and the theatre went dark suddenly a burst of colour appeared on the stage and I was in aw and ever since that day ever since that one amazing show I have wanted to be just like those girls on that stage living the dream at the Mayflower.